Elvis fans from around the world will gather in Middle Tennessee for the 4-day festival, filled with celebrity appearances, live music performances, an Elvis movie screening and 26 of the best Elvis tribute artists from all over the world. 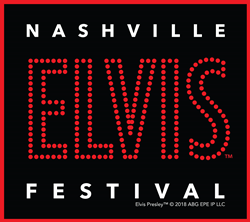 Elvis™ fans from around the world will gather in Middle Tennessee March 28-31, 2019 for the 3rd annual Nashville Elvis Festival, celebrating the music and legacy of the King of Rock & Roll™. The historic Franklin Theatre, located just south of downtown Nashville in the charming suburb of Franklin, Tennessee, will serve as the host venue. Tickets are on sale now at http://www.NashvilleElvisFestival.com. The 4-day festival will be filled with celebrity appearances, live music performances, an Elvis movie screening and 26 of the best Elvis tribute artists from all over the world. In addition, two special VIP events will feature live recreations of Elvis’ recording sessions - both events will take place inside Paragon Studios - one of the nation’s top recording studios. Special guests confirmed to appear include JOHN SCHNEIDER, iconic actor and chart-topping recording artist; TERRY BLACKWOOD, who recorded and toured with Elvis as part of the GRAMMY Award-winning Gospel group, The Imperials; JOANNE CASH, legendary Gospel artist and the younger sister of Johnny Cash; GARY CHAPMAN, award-winning singer-songwriter and TV/Radio personality; GREG PRESLEY, Elvis Presley's 2nd cousin; CHARLIE MATTOS, on-air personality at the world famous WSM Radio; and JEFF LEWIS, GRAMMY-nominated singer-songwriter, actor, emcee and award-winning Elvis tribute artist. Nashville Elvis Festival will also feature headlining performances by some of the top Elvis Tribute Artists in the world. Scheduled to appear are Ultimate Elvis Tribute Artist world champions DEAN Z and BRANDON BENNETT; Nashville Elvis Festival 2018 champion, DIOGO LIGHT; 2018 Images of the King world champion, COTE DEONATH; and award-winning Elvis tribute artists MICHAEL CULLIPHER and RILEY JENKINS. The festival will also be hosting an Ultimate Elvis Tribute Artist Contest preliminary round with the winner moving on to Graceland's Ultimate Elvis Tribute Artist Contest Semifinal Round in Memphis during Elvis Week 2019. Twenty contestants have been invited to compete in Nashville, coming from all over the USA as well as Canada, Norway, Chile, Australia and the United Kingdom. Backing all live performances will be the incomparable EAS BAND, known for their performances all over the world backing tribute artists and giving the feeling and excitement of being at an actual Elvis concert. Nashville Elvis Festival is hosted by TOM BROWN, host of "Tom Brown in the Morning" on Tupelo's Sunny 93.3 and the former Vice President of Original Production for Turner Classic Movies (TCM). Elvis fans will recognize Brown as a longtime host of Elvis events nationwide, including select Graceland events and the "Gates of Graceland" web series. For tickets and information, please visit the official website at http://www.NashvilleElvisFestival.com.